This recipe has been brought to you by McCain. Begin by browning off the beef cubes, until they resemble a deep golden brown and remove the meat from the pot and set aside for later use. In the same pot, fry off the onion, garlic, celery and carrots. Add the tomato paste and the beef stock and cook. Add the bay leaves; paprika and parsley, mix through before adding the chopped tomatoes to the pot. Allow the tomatoes time to breakdown and soften. Deglaze* the pot with the red wine and reduce. Add the water and the meat and simmer for 45 minutes stirring occasionally. 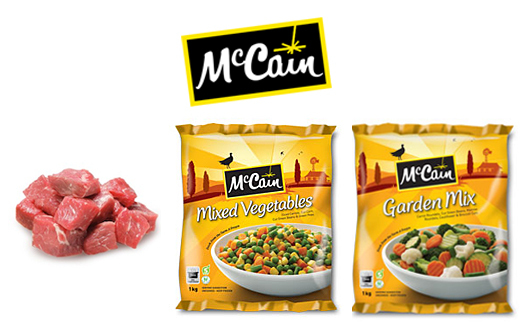 Stir in the McCain Mixed Vegetables and McCain Garden Mix and cook until tender. Season well with salt and pepper and serve hot. Deglazing means to pour a cold liquid into a very hot pan in order to loosen the caramelized bits of food stuck to the bottom of the pan (which are filled with flavour and make a delicious sauce). Before you start, make sure there are no burnt bits at the bottom of the pan, pour off most of the fat in the pan, turn the heat up to high, add cold liquid to the hot pan and the liquid will boil up very quickly, however if you are adding liquids which contain alcohol be sure to remove the pan from the heat as you add the liquid, use a spoon or spatula to scrape up the mixture as the liquid boils. Once the mixture has dispersed throughout the liquid turn down the heat.